Again we are presented with idealistic situations where wealthy protagonists use their advanced visualisation capabilities to prevent catastrophe. 'Jack Bauer' from the '24' television series is perhaps the strongest example of the media legitimising surveillance. Bauer uses his panoptic capabilities to monitor terrorism, the show also necessitating torture as a means of extracting information. Where these potentially controversial methods could be questioned and explored in the show, they are simply glorified. Bauer never accidentally spies on or interrogates an innocent civilian. Viewers are in fact encouraged to intrust this large responsibility in the hands of the protagonist. Hassler-Forest went on to discuss Alan Moore's 'Watchmen' graphic novel. With the character 'Adrien Veidt', Moore explores the panoptic gaze of the entrusted superhero and places it under scrutiny. 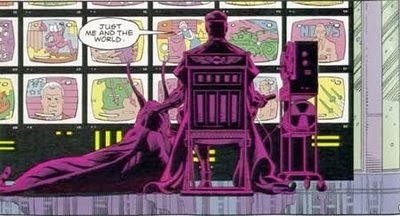 Veidt uses a wall of screens to monitor both television broadcasts and surveillance footage simultaneously. By analysing trends in advertising, Veidt in one sequence decides a war is imminent so tells a servant to invest appropriately. This depicts Veidt as a Neoliberal, partaking in disaster capitalism. Although he is entrusted with his great wealth and power, he ultimately destroys Manhattan and arguably betrays its citizens. I plan to elaborate on this concept of panopticism within the superhero genre in my extended essay.